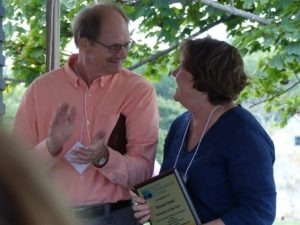 Nearly 150 members, partners, friends and guests gathered in mid-September 2015 at White House Farm outside Luray, VA to celebrate a quarter-century of conservation successes in the greater Shenandoah Valley region. A lovely afternoon event, the program included farm tours, live music entertainment, educational exhibits, a silent auction, a picnic supper, a membership meeting, and time for folks to catch up. Event sponsors included MillerCoors, Union Bank and Trust, and numerous other companies, organizations, and foundations to whom we are very grateful for their outstanding support. Click here for a complete listing of our sponsors. During the membership meeting, VCC Board Chairman Mark Botkin presided over the re-election of two Board members: VCC Vice-Chairman Bobby Whitescarver and VCC Treasurer Butch Snow. Mark also presented awards to the following individuals for their outstanding efforts over the past year: Conservator of the Year – Joe McCue; Volunteer of the Year – Brenda Mead; Director’s Recognitions – Pat and Chuck Blackley, Bob Barron, Barbara Brothers, Bill Howard, and Kathy Moore; and Special Staff Recognition – Sheryl Van Gundy. Maddie MacNeil and the members of Hound Dog Hill Band provided the music. Catering was by Shaffers Catering from Woodstock. Silent auction items were contributed by Shenandoah Valley artists and various historic inns and hotels in the Valley. All attendees for the afternoon event were especially grateful to Scott Plein (owner of White House Farm), Chris Anderson (Executive Director, White House Farm Foundation), and the farm staff for their exemplary hospitality.